Handwoven mats are by no means unique to a single culture or country. Traditional ways of of weaving and dyeing mats have been passed down and celebrated in places like Indonesia, India, and Mexico—all across the globe. However, the materials used differ; as well as the common varied uses and enduring popularity of each kind of mat. This article will be focusing on the baníg from the Philippines, which is handwoven but not made of textile. 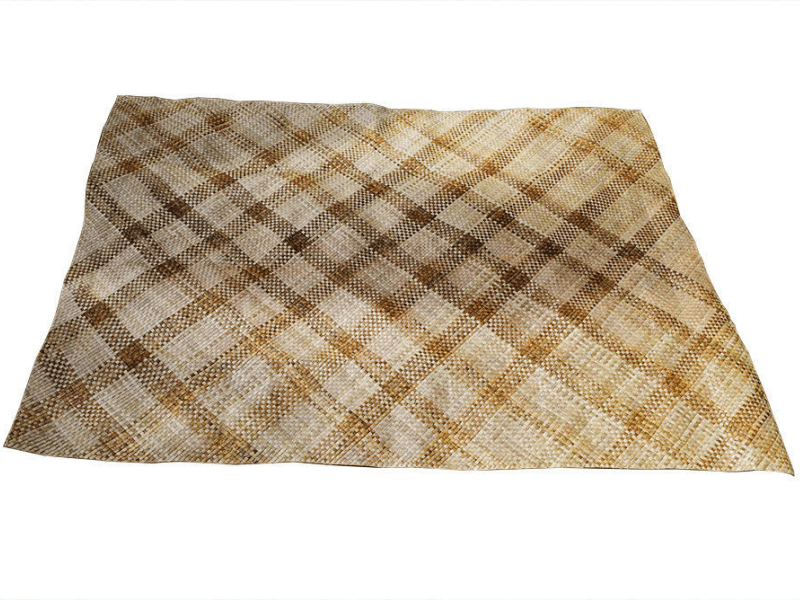 How Is the Baníg Different from Other Handwoven Mats? The baníg is similar to a Latin American petate or a Japanese tatami mat in that it is composed of dried leaves; and is often used for sitting and sleeping. Unlike the tatami, though, a baníg can come in many shapes, sizes and colors. Also, a baníg design—down to the very materials used—changes depending on the Philippine region it is from and on the ethnolinguistic group that made it. This is different from a petate; which is generally made from the plant Leucothrinax morrisii, better known as the palm of petate. A baníg can be made from dried palm or pandanus leaves, or blades of swampy reed grass. The drying process, sometimes under direct sunlight, strengthens the material and imparts a shiny brown tone. Sometimes the leaves are dyed before they are cut into thin, manageable strips. Then they are hammered and wound to preserve softness and pliability. A baníg can have colorful patterns on it for decoration; however, it is likewise very common to find a plain brown baníg for everyday use indoors—particularly for sleeping—especially in provincial homes. How Is a Baníg Used? 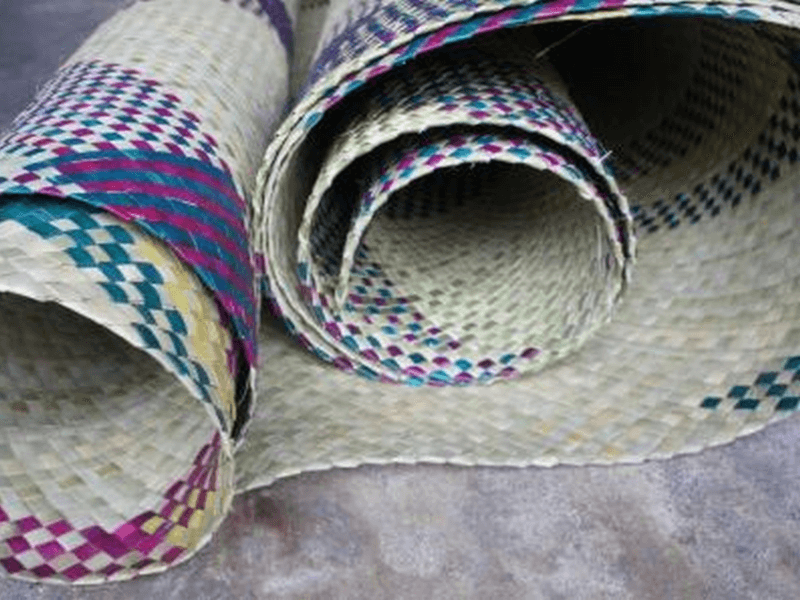 There are no set rules for using a baníg; in fact, though it’s traditionally used for sitting and sleeping, many modern homes in the Philippines and around the world use these handwoven mats for purely decorative purposes, as wall hangings or in place of rugs. 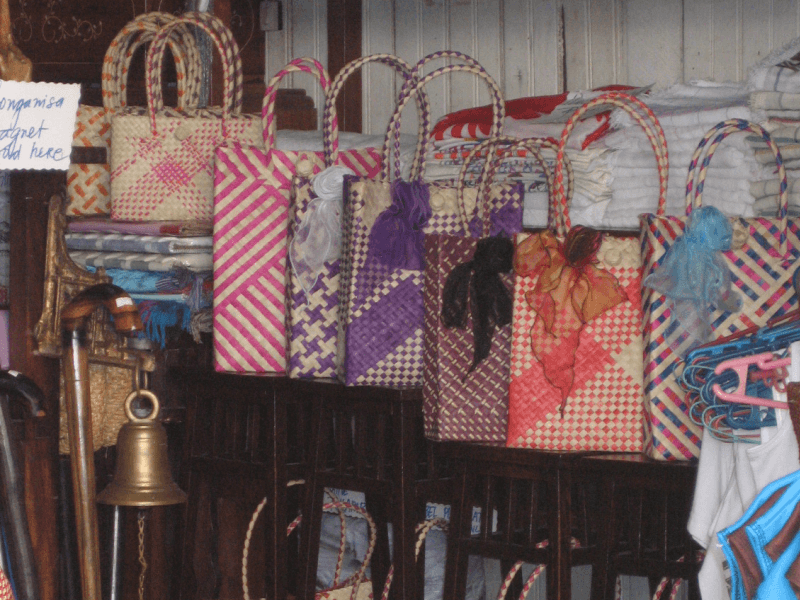 There is also a proliferation of baníg products—made using the same weaving process—that are actually not in sleeping mat form: bags, place mats, and the like. These are usually found in areas popular with tourists, as they make good souvenirs and are not as cumbersome to carry around, compared to a large mat. To use a baníg for sleeping, simply unroll it—indoors or outdoors, on the ground or on an elevated surface. On the ground it makes for a simple covering so you don’t sleep directly on the floor; do not expect much cushioning unless you put a mattress or any other kind of soft material underneath it. You can also lay it over a slatted base; what it lacks in softness and comfort, it makes up for in airflow and cooling. In traditional Filipino homes where it is still used—and there are not very many now, as mattresses are far more convenient and common—it is typically kept rolled up and leaning against a corner of a room, or laid down at the foot of a bed base. As it is made of dried leaves, it is very lightweight. Because of its portability, you can also use it for picnics or beach trips. What Are the Different Kinds of Baníg? As we noted above, differences in design are normally found in the material used and patterns woven into the baníg. However, the colors used and the typical motifs play a part in this, too; as well as the size and shape of the finished product. For example: The Badjao of the Sulu province of the Philippines are boat-dwellers. Their baníg designs reflect their way of life; with colorful and geometric patterns punctuated by representations of waves, boats, crabs and other marine life. The Samal of the Tawi-Tawi province, in contrast, is agricultural—though they live on an island far removed from the rest of the country. While they feature the same color palette in their weaving as the Badjao, they prefer stripes and zigzag patterns; and the hues are muted. The baníg from Tawi-Tawi is also usually softer in feel and texture. The Maranao of the Lanao provinces and the Maguindanaon of landlocked Cotabato—both in the island group of Mindanao—use rush plants to make round baníg designs. Their color palette features a deep maroon in place of a bright red, and markedly less orange and violet. The patterns are spontaneous, irregular, and geometric. The Tboli, also from Mindanao, make their baníg products with simplicity in mind. The dried reed plants that are not dyed at all. Perhaps the most popular and most ubiquitous kind of baníg in the Philippines is the type that comes from the province of Samar in the Visayas—specifically from the municipality of Basay. Weavers from this area have merged tradition with contemporary and popular motifs, and use the widest range of colors and patterns. The designs range from flowers to portraits and profiles of famous local and foreign figures. While it is true that the baníg has fallen out of favor in terms of nightly use, its enduring popularity can be attributed to two things: that weaving and designing these sleeping mats is an art form in itself, and that they are truly comfortable in certain situations. If it is very hot and you happen to have no access to fan—or if you need to sleep outdoors—a baníg will keep you cool and clean. We mentioned picnics and the beach earlier; these are good examples. Tired from the day’s activities and just want to nap? A baníg is more comfortable and sanitary than sleeping directly on the grass or the sand; and unlike using a cloth mat, it’s easy to sleep. Just shake or brush the dirt off. The bottom line: While it may no longer be practical for daily use, it’s good to have on hand, especially if you live somewhere hot or if you spend a lot of time outdoors.